- Labor Day Weekend is known for being the unofficial end of Summer, and for me it was the official end to summer hiking in the White Mountains as I would soon hit the road and head out west to meet Whitney for her PCT hike finish. With that in mind I looked over my maps and pieced together one last summer “ultra” run/hike in the White Mountains. With my knee healing up well I decided it was time to test it out, just not over continuous rocky terrain, so the route stayed low over the very forgiving terrain of the old East Branch Railroad grades through some of the more secluded trails in the Pemigewasset Wilderness. 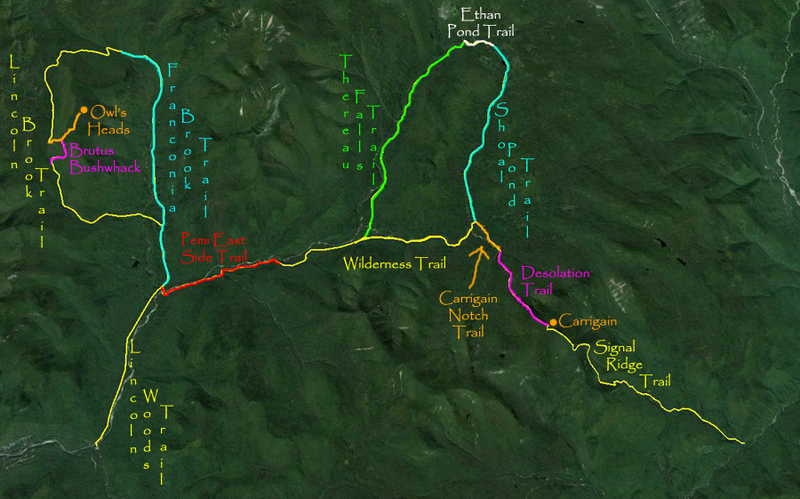 I ended up calling the route the "Pemigewasset Roller Coaster" from the two loops it made when highlighted on the map. - As with most of my adventures I asked Kyle if he'd like to join in, he was game even with a fractured hand! On Saturday I met him at Signal Ridge trailhead to spot his car before getting a good night of rest for Sunday's early wake up call. - We started out on the Lincoln Woods trail for an easy three miles to the Pemigewasset Wilderness boundary. 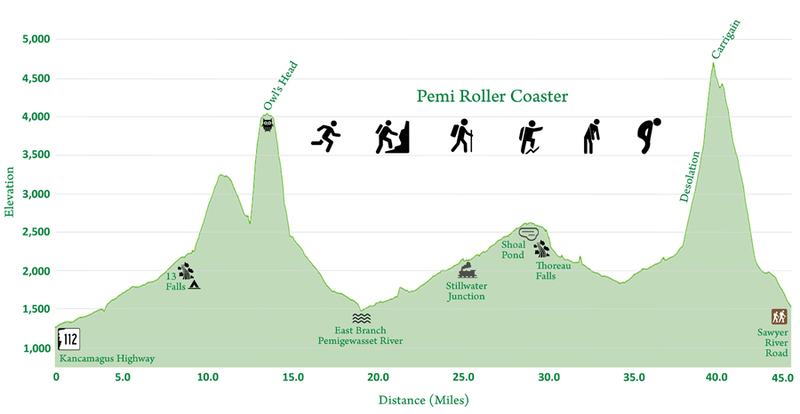 Next up was the start of the first loop of the so called roller coaster, the five mile trek deep into the Pemi to Thirteen Falls along the Franconia Brook Trail. With it being Labor Day Weekend this trail as well as all others we would be tramping on throughout the day would avoid the crowds. The Franconia Brook Trail is flat and has excellent footing so we trail ran to Thirteen Falls and took a break to filter water, refuel, and organize or food for the next segment. - From Thirteen Falls we hooked onto the Lincoln Brook Trail and headed up over the height of land and then down to the Owl's Head Path. Unlike the Franconia Brook Trail, the Lincoln Brook Trail is much more wild and rugged with some faint sections of trail and sub-par footing spots. - When we reached the junction for Owl's Head path it was time to gain some serious elevation up Owl's Head Slide and the relentless slog in the woods up to the ridge past the slide. It's never easy to head up the slide and even more tedious to descend it so on the way down we took the Brutus Bushwhack back to the base of Owl's Head, it's now my preferred descent as it travels over a herd path with nice footing until it intersects an old skidder road followed by a drainage. - The bushwhack ends right near a water crossing where we did more filtering, refueling, and preparing for the next segment, the final part of the first loop back to Franconia Brook Trail back to the Wilderness Boundary and across the East Branch of the Pemigewasset River. As we headed back to the boundary we saw about a dozen hikers, after that we'd see about a half dozen more over the next two dozen miles! - The water crossing of the East Branch was very easy with there virtually being no rain all summer. 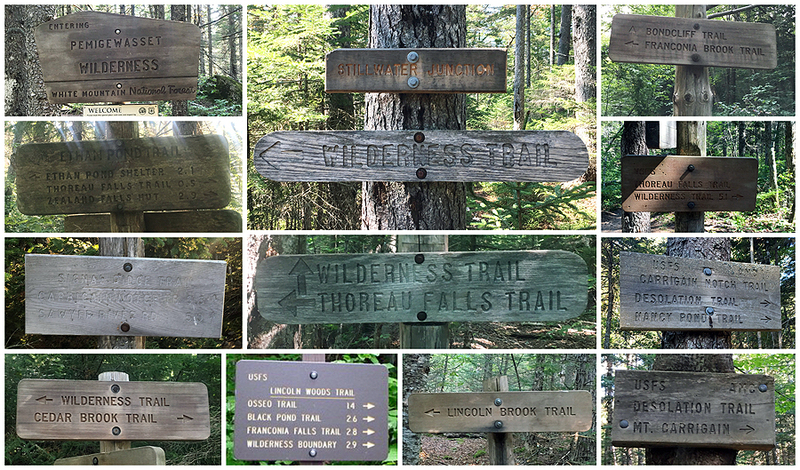 Once past the crossing we would be hiking some of the most lightly used trails in the Whites, the Pemi East Side Trail east of the wilderness boundary, Wilderness, Shoal Pond, Thoreau Falls, Carrigain Notch, and Desolation trails. Almost all of these trails are over the old East Branch Railroad from the pre WWII era. The trails also pass by a few old camp clearings with old relics just off trail, some are easy to spot and others can be found with a little exploring. Since we were in the midst of a big mile day and wanted to finish before sundown we didn't get a chance to stop and explore like I have done in the past but we will be back in October during foliage to spend a day on and off trail along Thoreau Falls, Wilderness, and Shoal Pond trails. - When we reached Stillwater Junction it was time to start the second loop of the coaster; Shoal Pond, Ethan Pond, Thoreau Falls, and Wilderness trails. Unfortunately, this is where I parted ways with Kyle as he had been battling stomach issues all morning and was feeling cramps coming on, so he skipped out on the second loop and headed to Desolation and up and over Mount Carrigain where he'd wait for me at his car. - What can I say about Shoal Pond and Thoreau Falls trails? They parallel each other on each side of Shoal Pond Peak, and both are secluded and quiet but definitely have a different feel to them. Shoal Pond Trail south of Shoal Pond feels ancient with quite a few easy to step-over blowdowns and weathered trees and some old man's beard. The footing is a more muddy and rugged (roots) than the Thoreau Falls Trail too. The Thoreau Falls Trail drops down from the falls and then heads along the North Fork for about half of it's length over some of the softest footing in the White Mountains. There is also a lot more to explore off trail just across the river, a few old railroad camps and a plaque for a plane crash commemorating two people who died in harsh winter conditions from that crash. The memorial and one of the camps, New 22, used to be part of the trail before it was relocated to it's present location across the river. It's too bad about the change as the railroad grade along the old trail is really nice, can still be easily followed, and actually feels like the Shoal Pond Trail since it has some small step-over blowdowns. - After finishing the second loop of the coaster I continued on the beautiful Carrigain Notch Trail before starting the hellish climb up the Desolation Trail as I hit the forty mile mark of the day! Needless to say it wasn't pretty, I did ok over the first mile up Desolation as it's not too bad, but the second mile is pretty hellish, the trail becomes a jumbled mess of slick boulders and it's as steep as any trail in the Whites for about a half mile. I very rarely get flustered on hikes, but Desolation's flurry of punches put me in full rope-a-dope mode until a tenth of a mile from the top. - Mount Carrigain's summit is usually a crowded place on a weekend, especially a holiday weekend, but not at 5:45PM! I had the whole summit tower to myself and took a ten minute break taking in the great views in every direction. The late day shadows growing over the Pemi Wilderness looked incredible and I could see where we had been throughout the day which was pretty cool too. - The descent didn't go that well at first, the top section of the Signal Ridge Trail is rough and is not built for speed, luckily the lower half of the trail can be run at high speeds so I was able to pick up the pace and make it to the trailhead where Kyle was waiting for me twelve hours after we started and 45ish miles later. - Back at the car I got changed and I treated Kyle with dinner and drinks at the Red Parka for being a team player and waiting at the end. This odd water crossing on the Franconia Brook Trail is one of my favorites, notice the old stump and the tree that has taken up residence in it! I took Kyle through the Camp 9 clearing figuring it would be dry and just a little scratchy...It was flooded by recent beaver activity, sorry Kyle! Even with the beaver flooding, there is a great view of Owl's Head! You never know what you will stumble upon deep in the wilderness! The Shoal Pond Trail starts off through a really cool narrow fern tunnel! Desolation Trail, rough and steep! Congrats on another nice long ultra! Ethan were on the East Branch side a couple of weeks ago cleaning up some redlining, all the way out to the Desolation junction. I have that exact same photo of the old cook stove! I came home and double checked in my logging railroad book which camps we passed, you're not the only nerd in the woods. LOL. Good luck on your upcoming trip out west. Thanks Summerset, I can't wait to see Whitney again! Hey Chris! - Great account of the day...very detailed and it made me feel like I was right there next to you. Your maps helped a lot as I'm unfamiliar with some of the trail names so scrolled down to use your map as reference with each bullet. Pics are great as well! You always amaze me with the artifacts you find. You did a great job capturing the trail nuances as well which complimented your descriptions (such as the Shoal Pond Trail being ancient). Thanks Karl, glad you liked the report and pics. There real is a ton of history deep in those woods, a little exploring online and you can find some good info, or better yet stop in at the Mountain Wanderer and talk to Steve, he is more accurate with locations and the history, my findings while still accurate might be a little off here and there. For example, the Camp 9 'clearing' is something that I just came up with myself because camp 9 is in the vicinity, so I'm not sure if it's referred to as this by others or just called mud bog!